This is the second week of kitchen set up. We are waiting for a Jenn-Air gas cooktop from someone who is using it until their new kitchen is installed. In the meantime seemed like the next item needed was an oven. After all Thanksgiving is right around the corner. 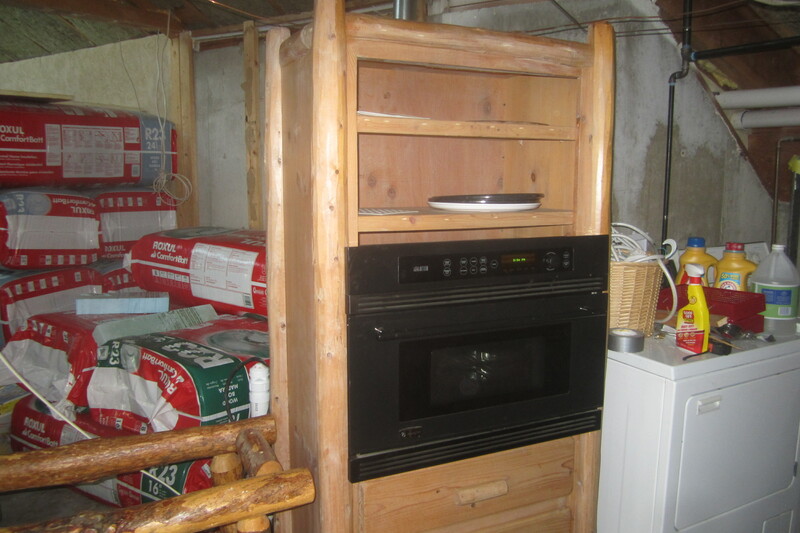 I bought the log cabinet for the oven first so then had to find an oven that would fit. Since it is narrower than a regular kitchen oven cabinet, I almost bought another cabinet instead but then I ran into an interesting solution. 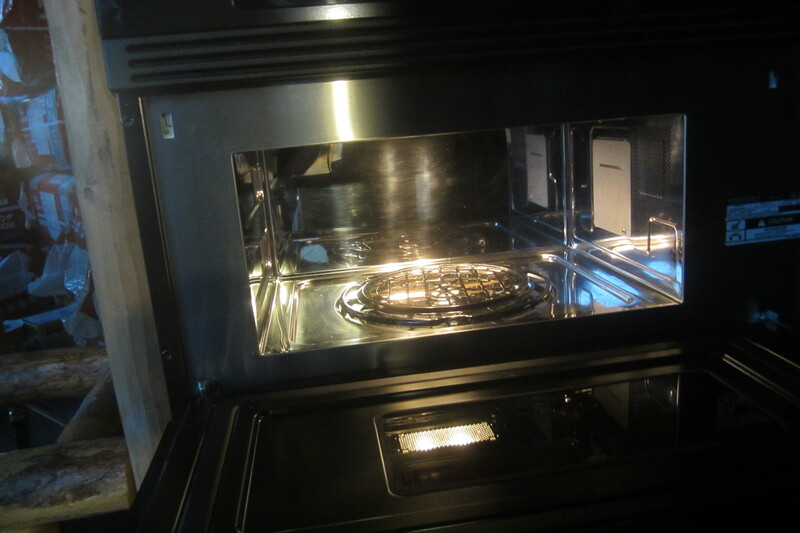 GE first manufactured a microwave that was supplemented by halogen lights for oven cooking in 1999. They are still releasing these although there have been several improvements over the years. Notably their 240 Volt version now has convection cooking which our 2002 model bought on craigslist for $100 does not. Microwave ovens are considered about 5 times more energy efficient than conventional ovens and the Advantium is basically a microwave, but when it is time to bake and brown food, it combines heat from halogen lamps with microwaves in a ratio that simulates regular oven cooking but decreases the time needed to cook by 25% or so. GE claims that the ovens are at least 25% more efficient than regular electric ovens. Some foods cook eight times faster than in a regular oven. Tonight’s dinner was set on “hamburger” and was roasted/broiled/done in about 5 minutes. Energy Star does not yet evaluate residential microwaves or cooking ranges/ovens. But just using a technology that takes less “on” time and fewer watts makes sense that it is energy saving. There are capacity issues with this type of oven but we are only cooking for the two of us and this should serve us well for the time being. We can make a small tray of cookies or biscuits, roast meat, bake casseroles etc. in this super-microwave! Notice the cooking trays on the shelf of the cabinet. The ceramic tray is for regular microwave use, one metal tray for speedcook functions, and the other metal tray has ridges for cooking meats directly on the tray. The interior looks like a regular microwave but its stainless steel. I ran across this article about Energy Smart cooking that recommends the use of electricity as the most efficient form of cooking while gas is the least efficient, although also least expensive form. Microwaves with bake options are considered a step above regular ovens when it comes to saving energy.